Navigation: Home » Economics » How Many Millionaires Are There in America? One of the most common questions we receive here on DQYDJ is “How Many Millionaires Are There in America?” Today, let’s dive in and estimate the number of millionaires, as well as $2, $3, $4, $5, and decamillionaires. We estimate that there are 14,814,453 millionaires in the United States. Our estimate puts the millionaire net worth goal at the 88.24% wealth bracket in the US in 2016, or 11.76% of all households. Note: for this stat and the subsequent ones, we are only discussing household data. Remember, net worth isn’t generally divisible between household members (short of court-assisted situations). Additionally, all data includes the value of any primary home. This net worth percentile calculator allows you to turn off home equity. All data, as in the net worth bracket article, comes from the Federal Reserve’s 2016 Survey of Consumer Finances. How Many Multimillionaires Are There in the United States? More than $2 or $3 Million? Our estimate is 7,647,278 American households have $2 million or more, and 4,665,039 households have $3,000,000 or more in net worth. $2 million or more in net worth covers roughly 6.07% of households, while $3 million or more covers 3.70%. Reversing those, you get the 93.93% and 96.30% wealth percentiles. How Many $4 or $5 Millionaires are There in the US? There are somewhere around 3,527,878 American Households eclipsing $4,000,000 in wealth, or 2.80% of all households. Likewise, there are around 2,888,408 households with $5,000,000 or more, 2.29% of households. Those are the 97.20% and 97.71% percentiles, respectively. How Many Decamillionaires are There in America? The nice thing about $10,000,000 is it has an associated name, “decamillion”. There are roughly 1,347,336 decamillionaire households in America. This isn’t quite the one percent for 2016 in the US; our estimate pegs 1.07% of households as decamillionaires, or the 98.93% wealth percentile. (See our breakdown on the one percent in America). How Many Americans Have More than $50,000,000 or $100,000,000 in Net Worth? 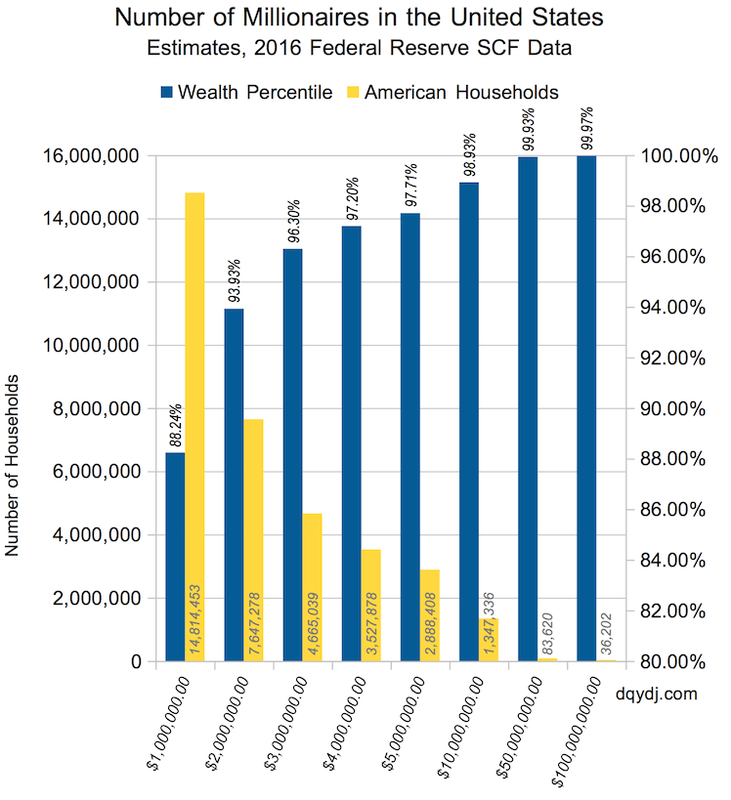 Some caution: SCF data is stretched at these extreme wealth goals. There are larger gaps between datapoints, and some very high net worth survey responses aren’t in the public set. That said, we estimate there are somewhere around 83,620 American Households with $50,000,000 or more, and 36,202 households with $100,000,000 or more. That maps to the top .07% and .03% of households, and 99.93% and 99.97% net worth percentiles. Again, up at these net worths statistics are hazier. You’re almost to the point where polling these households would give better data. These are the right orders of magnitude, but we’re very solidly in the business intelligence zone here – don’t quote this section in your term paper. A few surveys address this population, such as this one from Credit Suisse. Their survey uses the 2013 SCF and projects forward, and their estimates are about 30% fewer households in each bracket than ours. How Many Americans are Billionaires? Just messing with you… we won’t try to answer that here. Try the Forbes Billionaires List or the Bloomberg Billionaires Index. Yes, there are so few billionaires they’re all individually trackable on a daily basis. More than 10% of all households in America are “Millionaire Households”. That’s close to 15,000,000 homes rocking the double-comma. There were roughly 126 million households in America when this data was collected. And now here’s all of the numbers we mentioned above, but this time in a table for easy copy & paste. Share with your friends! Wealth Benchmark Wealth Percentile How Many Millionaires? We hope you had as much fun exploring the wealth data as we had running it down. See anything interesting in this data? Are the numbers higher or lower than you suspected? Do you agree a million isn’t what it used to be? Interesting. This makes becoming a millionaire feel even more possible! Surely I can do it if over 14M other people have. Thanks for sharing! I’d be at least curious to see the #’s if you exclude the equity in the primary home. I thought I’ve seen other #’s claiming that ~7% are millionaires and those lower figures may have excluded the home. But maybe its just dated information I’m remembering and it grew since then? I think that including the primary home skews it of course. Look at a place like CA where the home itself can have $1M of equity. Of course those people are still millionaires (at least on paper) and they could sell that home and take the equity. $1m is absolutely not what it used to be. Thurston Howell III used to be considered stinking rich as a mere millionaire. Now a million is just a pretty nice retirement nest egg. Of course! Keep it a secret though, these’ll go in the calculator – net worth of $1,000,000 not including primary home equity is the 91.07%, so 8.93% of all households with the 2016 data. I agree that NW information without home equity would be quite interesting but I don’t know where you can get that data set or even extrapolate (the cost of a house in San Francisco is much higher than one in Portland Maine). There is a big gap between 10 million dollars and 50 (or 25). It would be interesting to see how those numbers break out. The groovy thing is if you can average a 7 % return the nest egg will double in ten years. Open a Roth IRA for your teenager once they have earned income. Amazing how it will grow. So you left out the number of households in the 99.5 (or roughly 16 million dollar NW) category. Can you give us that? (a) does the data provide any sense of geographic dispersion of the various NW ranking? (b) what about average age? I would expect the higher the NW the higher the age? (c) I don’t think we have access to the survey questions but how do people value their private businesses for purposes of this survey – seems like that might be a significant variable at the higher NW percentages? First, a caution – the uncertainty is higher at these percentiles (not as bad as 99.3 and 99.7 sure, but just a note). 99.5% is $16,115,373.10 – but please just assume it’s “around” that number instead of holding it up as exact. a) It does, but there are only 6,248 points so we have to be careful slicing too far. Stay subscribed though, I’m talking over what’s responsible with the co-writer (and calculators first!). b) Ha, this is one of the calculators in the works. We’ll get this one. c) The questions are available. On this page: https://www.federalreserve.gov/econres/scfindex.htm search for ‘Codebook (2.7 MB ASCII)’. It lists every question in the dataset there; we’re looking at a fair way to divide wealth compositions too, but please feel free to surface interesting ones from the questions. I think I wasn’t clear about my first question. I was trying to understand how many households have the 16m net worth in the 99.5% ranking. Thanks again and looking forward to the further posts. Regarding my earlier question – would it just be 1/2 of the 1.35 million or 673,668 households? I’ve seen a couple reports and this “calculator” http://www.globalrichlist.com/ which I think is dated and a little dubious. Yes, no trickery here I promise. There are ~126,000,000 households so you can take the size of the percentages and multiply: 126M *.005 = ~630,000. The true number in the dataset is 125,981,700… but be careful with sneaky looking precision; consider it a rough count. Also, check out the net worth percentile calculator we just posted – I added household counts directly in the tool so it should be quick to estimate now. 14,814,453 millionaires? Wow. That’s approximately 5 times the popuation of my country (Jamaica). As Lance said, this is surely motivating for someone looking to become a millionaire in America. There is a large gap between $10,000,000 and $50,000,000. Have you calculated the number of households/individuals with $20,000,000 or $25,000,000 of net worth? Your research is outstanding! Not only is it informative but most interesting. I hesitate to calculate numbers in this area (and getting to $50,000,000 with this set is already a stretch) because of the distribution at the top end. You could eyeball a rough cut, but net worth ramps very quickly at the top end. Thank you for the kind words! We’ll keep them coming. We had some requests to break it down by “generation”, so keep an eye out for those posts to roll in. Any comments as to why the IRS’s personal wealth data paints so different a picture?